In gardening, there are some habits that you need to be break. This article will discuss the different gardening activities that starters should avoid. Gardening is fun and exciting if you do what’s right for your plants. It is fulfilling to see them growing healthy every single day. If you’re a beginner, it’s highly advised that as much as possible you follow by the book. Don’t make an experiment if you are not sure because that will just mess up your efforts. Asking assistance from an expert is always an effective trick before beginning your first garden venture. Gardening experts have their fair share of wrong habits. They tend to give less attention to simple details which results to complicated gardening scenarios in the future. Keep control and don’t be overexcited – before starting a project, planning is needed. This can be crucial because your plan will either make or break the entire gardening venture. So don’t be overwhelmed by the tasks, choose the right plants and decide what design is perfect in your home. Little knowledge of your location – before starting to plant on raised beds, do you know what plants are perfect in your area? Planting the wrong plants will void your time and effort. Also, determine if it is the right season to plant them, plants growing healthy in Texas might possible not to live in Arizona. Proper zoning is essential. Stick to the list – everyone has this feeling of excitement to grow lovely flowers they have seen on movies, magazines or televisions without thinking if it will thrive best in their area. Plants that require specific environment to live will most likely disappoint you in the end. So when purchasing plants in the nursery, stick on the list and never go overboard. No soil preparations – thinking that plants will just grow in any soil is wrong. Without a good soil a plant may either live poorly or die. Good soil means proper combination of clay, sand and organic materials. If you disregard this step, you might end up upset with the growth of your plants. Avoid overcrowding – yes, just like people, overcrowded areas tend to intimidate one from the other. With plants, they will be competing against each other over their needs and soon you will realize their irregular growth. Overcrowding can stress plants out, making them susceptible to get diseases. Overwatering – plants need water but not too much or else they will die. Starters might think that giving them more than what they need is good, it is actually not true. As long as you make sure that the soil is moist, your plants are safe. Beware of invasive plants – if you are planning to grow horseradish or English Ivy, be careful because they are invasive – they tend to pop up all over the place. 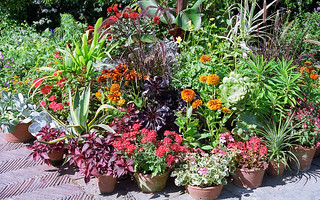 These types of plants are grown well in containers – easy management and limited space. If you want your garden to thrive think of simple details that might possibly harm them. These kinds of lapses are avoidable and can easily get fixed. Seek proper drainage – this will avoid your issue with overwatering. Dig and weed – this can solve your issue with invasive plants. Weed consistently to keep away those seeds or adapt solarizing – dampen the soil and cover it with black tarp, keep it that way for a few months and the heat from the sun will heat up the soil and kill those weeds. Keep the soil tested – each region may have various soil components, so before starting up the project have it checked. Also, keep equal amounts of compost in your beds to keep the plants growing healthy. Simple mistakes in gardening are controllable and easy to deal with. Gardeners with beautiful growing plants do not disregard little things that might create harm to their plants. So to avoid future disappointments, start your garden right and give attention to all details.